Why Don’t You Understand that Daniel Chapter 8 Has Already Been Fulfilled, Historically? I agree with you that when the four winds blow it brings about the end. What I don’t see is your viewpoint on the he goat coming against the ram in OUR TIME. As I’m sure you know, this is past history regarding Alexander the “first king” coming against the kings of Media/Persia. Now I know as a student of Shepherds Chapel since the 90’s we are to look at types from the past in scripture and apply it to the future. Never the less I believe everything in Daniel 8 through verse 22 is past history. The four that stood up from the kingdom of Greece were the four kings who were the forerunners of the Roman Empire. (Dan 8:17) So he came near where I stood: and when he came, I was afraid, and fell upon my face: but he said unto me, Understand, O son of man: for at the time of the end shall be the vision. In the latter time of THEIR kingdom. That seems to me to be the latter time of the four who stood up out of the Greek Empire when Alexander died. So bottom line is this: I don’t believe we have to see Iran attacked by anyone before the end can come. I believe verse 17 “…. at the time of the end shall be the vision.” is referring to verse 23 for the explanation of the vision, with the verses regarding the ram and the rough goat as past history that leads up to the latter time of THEIR kingdom which takes us past the ram and rough goat and brings us to those four. Some Christians believe in a two-fold fulfillment of the Old Testament Scriptures, and some do not. I’m one who does believe in a two-fold fulfillment, especially when any Old Testament passage contains details that have not yet historically come to pass. I agree with you that the prophesies in Daniel 8 were largely fulfilled in the days of Alexander the Great, when his army attacked and defeated Persia (Iran of today), and afterward, Alexander died and his kingdom was divided up among his four chief generals. That would have fulfilled Daniel 8:8. As I mentioned, I agree with you that, historically speaking, the above verse is about the death of Alexander the Great, and the rise to power, in his place, of his four generals. But note in that verse the phrase “toward the four winds of heaven.” That phrase directly connects Daniel chapter 8 to Daniel 7:2, with most Bible scholars agreeing that the prophesies following that verse are about the four phases of one-worldism leading up to the arrival of the antichrist. So we can see, historically, that while the “four notable ones” of Daniel 8:8 were Alexander the Great’s four generals, we can also see that in the second fulfillment of this prophesy, what I’d call the latter day fulfillment, those “four notable ones” will not be generals, but instead, global kingdoms, or phases of one-worldism that usher in the reign of the antichrist. So we can see that the prophesy in Daniel chapter 8 is not strictly historical. It does indeed have a dual fulfillment. And in the second fulfillment, or latter day fulfillment, you have the “little horn” (antichrist) rising up out of the final phase of one-worldism. Dan 8:10 And it [i.e., the little horn] waxed great, even to the host of heaven; and it cast down some of the host and of the stars to the ground, and stamped upon them. In other words, this has to do with the “war in heaven” described in Revelation 12:9-12, in which Satan and his angels fight against Michael and his angels, and they lose the battle, getting kicked out of the heavens and sent down to this earth. The “host” is the true church, and its “prince” is Jesus Christ. In the final days of this flesh earth age, Satan, in his role as the false Christ will be on this earth, and he will “exalt himself above all that is called God, or that is worshipped; so that he as God sitteth in the temple of God, shewing himself that he is God” (II Thessalonians 2:4). And yes, he’ll even stop Holy Communion from being taken by Christians. Christ Jesus is our once-and-for-all-times “daily sacrifice” (Hebrews 10:10). At that time, the antichrist (i.e., little horn/Satan) will likely argue that communion was only to be taken “in remembrance of Me” (Luke 22:19), and that since he is now on this earth (disguised as Jesus), taking communion is no longer necessary. Again, no matter how you interpret it, none of this ever happened in the time of Alexander the Great or his four generals who took over his kingdom after his demise. This points clearly to a second “latter day” fulfillment of Daniel chapter 8, since it was never fulfilled in the time of Alexander the Great and his subsequent four generals. In other words, the antichrist, his fallen angels, and all of their deceived followers on this earth conduct spiritual warfare against “the daily sacrifice,” meaning they deceive the world into believing they’re Jesus Christ and His saints having returned for Christ’s Second Advent in order to usher in the Kingdom Wedding. This is why Christ stated in Matthew 24:38 that just before Christ’s Second Advent, the people will be “marrying and giving in marriage,” just as it was during Noah’s day before the flood. We know that in Noah’s day the people were “marrying and giving in marriage” to the fallen angels (Genesis 6:2-4). In other words, Satan, in his role as the false Christ, will be teaching that all things have been fulfilled, and that it’s time for the Kingdom Wedding to commence, essentially deceiving Christians into joining with him, thinking he’s Jesus. Again, none of this ever happened in the time of Alexander the Great or his four generals. So we can see in these unfulfilled prophesies in Daniel chapter 8 that there has to be a latter day fulfillment of the events described in that chapter still to occur. And that’s why I’ll have to respectfully disagree with you say that “…everything in Daniel 8 through verse 22 is past history,” and likewise when you say the words in Daniel 8:17, “for at the time of the end shall be the vision” refers to an historical event that’s already passed rather than a future event that’s yet to be fulfilled. It has to refer to a future time, because none of what I’ve described above has ever happened historically. So yes, just as the Babylonian captivity of God’s People clearly is to have a dual fulfillment — the historical one having been fulfilled in the days of Daniel, and the latter day one to be fulfilled when the antichrist arrives in his role as the false messiah to usher in Mystery, Babylon the Great, the Mother of Harlots and Abominations of the Earth — so in like manner will the events described in Daniel chapter 8 have a dual fulfillment. The first fulfillment, as we’ve discussed, took place in the time of Alexander the Great (who conquered Iran/Persia) and his four generals who rose to power after he died. 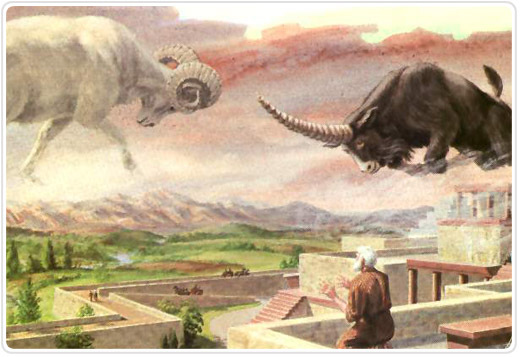 And the second fulfillment will be when Iran is attacked once again in the final days of this flesh earth age, and afterwards the he goat is taken out of the way and the “four notable ones” come up “towards the four winds of heaven,” meaning the winds of the end times are unleashed and the “four great beasts” of Daniel 7:3-7 (i.e., global kingdoms, or phases of one-worldism) begin to arise in succession.